Sometimes you just want to see your images in one place without a lot of fuss: You don’t need an image editor; you don’t want to move anything; you just want to browse your photos and possibly do some very light editing or share some images with others. For such situations ArcSoft’s $10 Photo+ stands out. Photo+, normally $10, but on sale for just $2 at the time of this review—is a seriously no-hassle photo viewer. It has an elegant, dark interface with a filmstrip-style photo bin at the bottom that lets you swiftly scroll through all your images. Choose a photo, and you get immediate information about it, such as its resolution, date taken, file size, and other bits of data you choose (in the app’s preferences) to see. If you want to view all your EXIF information in one place, just choose View > Show Info to see a separate window listing your camera model, exposure, and other routine data. You can view just your image, or reveal full EXIF information. Photo+ also offers a full-screen mode, and you can view photos at their original size or zoomed to fit the window. You can quickly flick through, zoom, crop, and delete photos using the arrow keys and trackpad gestures. The app also lets you designate particular photos as favorites. 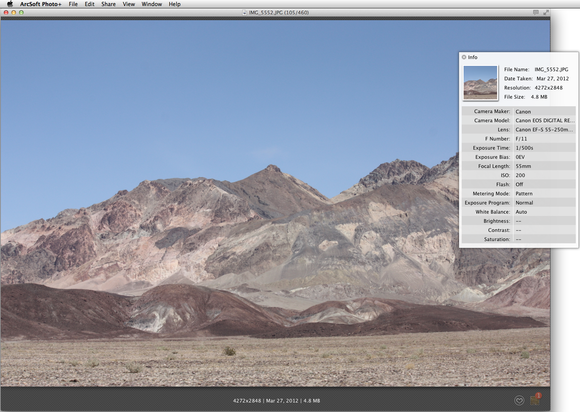 While viewing a photo, you can set it as your desktop or reveal it in the Finder. Photo+ supports over 35 image formats including Raw and animated GIF. 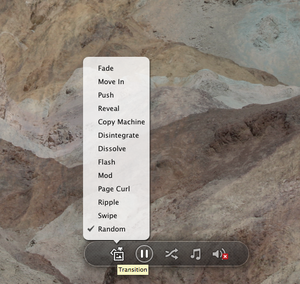 It also offers a slideshow mode with 13 playback options. Photo+’s viewing controls with the photo bin. Photo+ stands out as an alternative to iPhoto or Preview thanks to its faster viewing and built-in options for sharing photos to popular social networks such as Facebook and Twitter. As an example of its performance, I dragged a folder of nearly 500 images from my Mac’s drive into Photo+, and they appeared instantaneously. However, while the app has some nice touches, there’s scant built-in editing capability—you instead open an image in your editor of choice by right-clicking the canvas. One complaint is that Photo+ lacks options for viewing image collections. For example, sometimes I want to view a bunch of images in a grid for a quick overview, but Photo+ doesn’t provide such a choice. But that’s not a dealbreaker, as the filmstrip view at the bottom gives me a taste of multi-image previewing, and the app is fast enough that there’s little delay when scrolling through that strip. 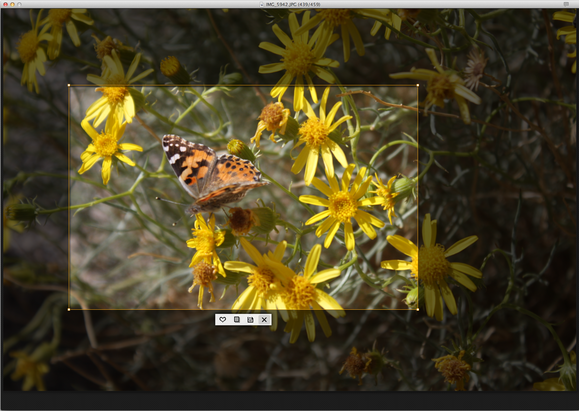 If you're using an Apple Magic Mouse, a slight swipe of the top lets you race through your images. You can perform basic edits, such as cropping, in Photo+. For other edits, you'll need to turn to an image editor. Note that ArcSoft Photo+ is not a permanent repository—unlike with iPhoto, images you add to Photo+ aren’t saved to the app. It’s a viewer, so when you quit the program and reopen it, you get a blank canvas, so to speak, to view a new batch of photos. Photo+ offers a number of options for viewing photos as a slideshow. ArcSoft Photo+ simplifies and streamlines the process of viewing photos. It’s handy when used alongside programs like iPhoto for deciding which photos to keep as favorites or which to use in an albums or cards. And though it doesn’t include complex editing tools, the app makes it easy enough to send your photos to the image editor of your choice. If you need to quickly look at a photo collection, devoting your full attention to viewing images, Photo+ is a good app at a nice price. ArcSoft Photo+ simplifies and streamlines the process of viewing photos.